Precision Automated Technology has produced a solutions White Paper titled Robotic Automation Streamlines Manufacturing In The Baking Industry. 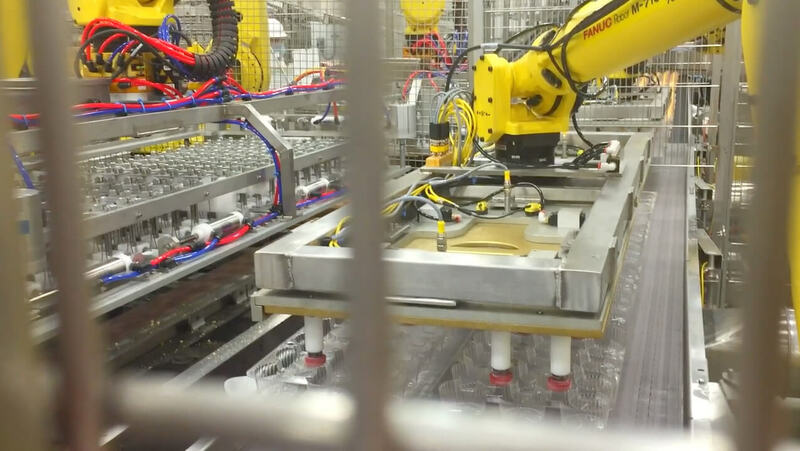 Precision solved a complex manufacturing problem in the baking industry by integrating robotic automation featuring Fanuc R-2000 and M-700 series robots. The White Paper can be downloaded here. The contents of the White Paper as well as video of the final project are found in the information contained below. Robotic Automation Streamlines Manufacturing In The Baking Industry. Project requirements can create production challenges that require unique problem solving. The requirement to use the same conveyor line for multiple product lines created a logistical problem. Precision Automated Technology was tasked with solving a space and production rate problem created by project requirements. Traditional manufacturing techniques are often slow, cumbersome, and eat away at profits. The traditional solution to the problem created was to invest in multiple interchangeable conveyors each uniquely designed to accommodate for different product runs. Robotic automation allows production lines to be more flexible, streamlined, and profitable. Precision Automated Technology was approached by a baking company that produces tens of thousands of cakes and cupcakes each day. The baking company had a goal and project requirement of streamlining production by using the same conveyor lines for multiple baked products. For this project it was cakes and cupcakes in multiple sizes and orientation. At peak production 1,200 cupcakes per minute traveled down the conveyor ready to be picked out of their baking pans and placed onto the packaging line. This production requirement and cycle rate created a unique problem. How can a single conveyor line accommodate for multiple products at different rates and still be streamlined and profitable? The traditional solution for a project such as this was to build multiple conveyors to swap in and out of the production line. Each conveyor would also have to be built with uniquely designed tooling to assist in the hand-off from the baking line to the packaging line. These additional conveyors provide a costly solution and create a space problem on the factory floor. Think of a train track when train cars are not moving. They have to be stored somewhere in order to clear a path for moving trains. Factory floor space is valuable, and using it as storage space is counter intuitive to the manufacturing process and profitability. So while additional inter-changeable conveyors provide a solution, they don’t provide a streamlined or cost-effective solution. 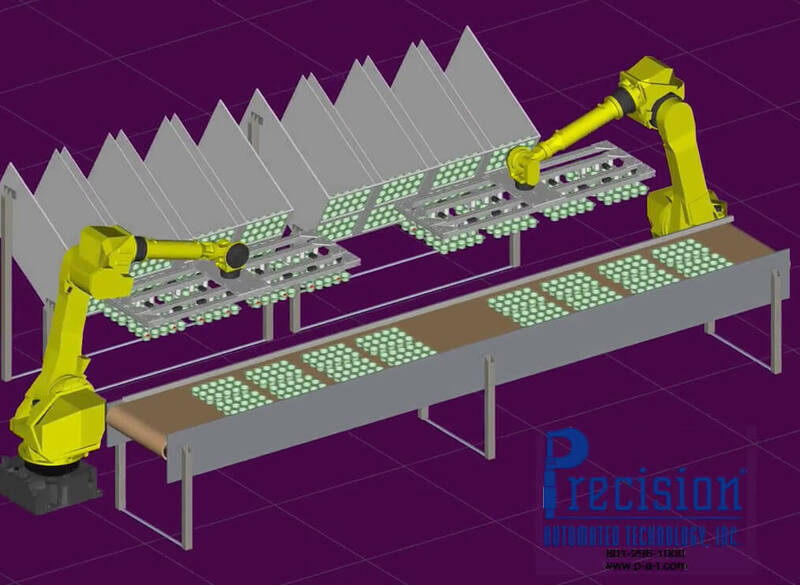 Precision Automated Technology designed a solution that incorporated four Fanuc robots. Two Fanuc R-2000 series and two Fanuc M-700 series robots. 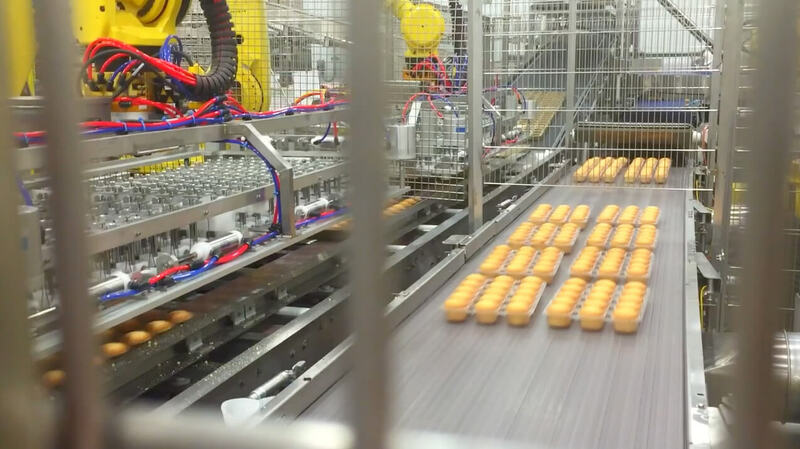 The two Fanuc R-2000 robots use vacuum to quickly and safely pull cakes and cupcakes from the baking line and place them on the packaging line. Cupcakes coming down the baking line presented a unique challenge. 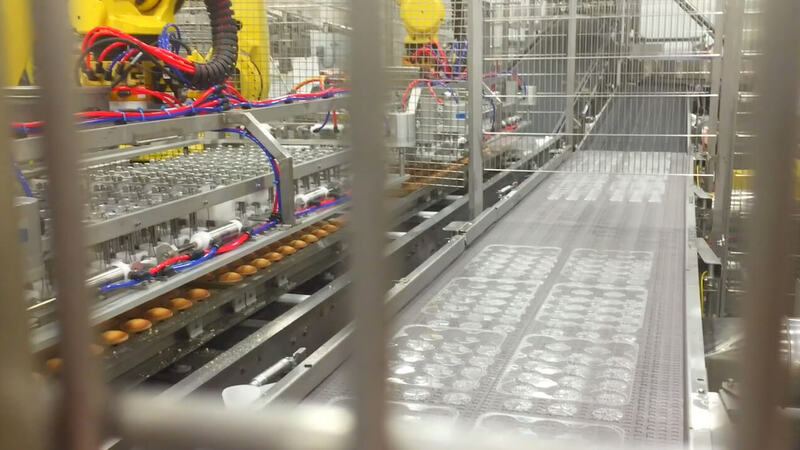 Once pulled from the baking pans by the robots, the packaging / placement pattern had to change in order to be arranged for proper placement on the packaging line. The End Of Arm Tooling (EOAT) on the Fanuc R-2000 robots rearranged the cupcake’s pattern on the fly while moving them to the packaging line. The two Fanuc M-700 robots used vacuum to denest clam shell packaging and place them on packaging line. The four robots coordinated a pick and place movement so efficiently that keeping up with the 1,200 cupcakes per minute seemed almost effortless. When a different product line of cakes or cupcakes came down the conveyor the EOAT on the Fanuc R-2000 and M-700 could be quickly changed to accommodate for the new product to be robotically depanned and denested. When considering to automate your baking manufacturing processes there are several items to consider. – Do you need a high speed depanning or denesting solution? – Do you need to a flexible cell that will allow a quick tooling change? – Do you need a turnkey custom solution? – Do you need to use the same conveyor for multiple product lines? If you answered yes to any of the questions above then integrating robotic automation to your manufacturing process is your best solution. Precision Automated Technology has variety options to best fit your project needs. Whether it’s the integration of a small single cell robot, or a high rate multi-robot cell, Precision Automated Technology has the perfect solution. Manufacturing requirements often require unique solutions. Is this case it was integrating two Fanuc R-2000 and two Fanuc M-700 series robots into the depanning and denesting section of the baking line. 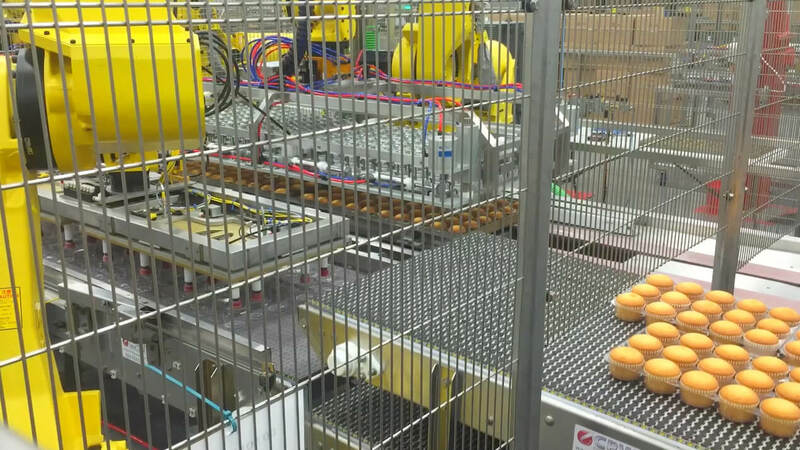 The robotic automation allowed for multiple product lines to use the same conveyor. When different product ran down the conveyor, the End Of Arm Tooling (EOAT) could quickly accommodate. The integration of robotic automation solved a unique problem that was able to keep production streamlined and profitable. For more information on how robotic automation can improve your manufacturing needs please contact Precision Automated Technology. Established in 1994 by Pat Johnson, Precision Automated Technology, Inc, has been transforming complex and labor-intensive production tasks and processes into smoothly operating automated systems. With the integration of the latest robotic technologies and controls systems, we are able to save our customers time and money while increasing throughput and quality. We excel at providing solutions where “off the shelf” or “stock” solutions do not exist. We provide equipment that will be an investment in the future of our customer’s company. Our reputation as a successful automation and robotics integrator has come from our ability to provide custom solutions to unique and demanding project requirements. We are able to provide complete custom solutions through all critical stages of a project, from conceptual design to installation and support. Our engineering and manufacturing facility is located in North Salt Lake, UT. Our building was designed and built to our specifications and to suit our production and design needs. Our location allows us to ship by a number of different means in an efficient manner to our many customers located throughout the world. A PDF of this information can be downloaded here.